Samantha Stosur loves the Lowcountry of South Carolina. Her affection stems, in part, from her title run at the 2010 Family Circle Cup, when she infamously throttled Vera Zvonareva in straight sets. At the time, the Aussie couldn’t articulate exactly how she dispatched the Russian in fifty-two minutes during the press conference. But the week, and that win in particular, has left a lasting impression on the veteran. Stosur, seeded No. 9 this week, seemed most excited about the Charleston dining, which she has planned out for the entire week. A happy Stosur is a gift for this tournament. Yet she is one of many happy women who have arrived from a month-long stint at the March Masters. For them, Daniel Island is a welcome reprieve from the hubbub of those two big events. Even Sloane Stephens was upbeat, a mood she rarely reveals. But she has her reasons; she had never won a main draw match at Family Circle Cup until Tuesday afternoon, defeating fellow-American Bethanie Mattek-Sands, 3-6, 6-3, 6-2. Eighteen-year-old Belinda Bencic loves Charleston, too. She has her reasons, too; last year she qualified for the main draw and made a breakthrough run to the semifinals. This year she’s seeded No. 12, and through to the next round after a quick win pver Australia’s Casey Dellacqua, 6-1, 6-2. 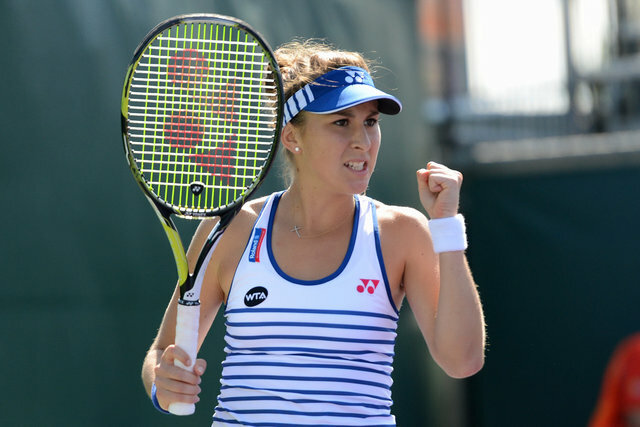 Since her Daniel Island debut, Bencic rose in the ranks to a high of No. 32 in October. She made the quarterfinals of the US Open and scored her first win over a Top 5 player — Caroline Wozniacki — in Indian Wells last month. Her shy, almost embarrassed, countenance seems to have been replaced by a youthful – yet wiser – young woman with a firm mindset. The Family Circle Cup is not all a flower bed of brilliant azaleas, dripping Spanish moss, and culinary delights, though. Hard courts are now a thing of the past – at least until summer – and that the clay court season has begun in earnest. Players must adapt to new court conditions – minute adjustments in their timing on the ball – and sliding, which can make their muscles ache at first. Jelena Jankovic, 2007 Family Circle Cup champion, felt the sting of that situation against Tatjana Maria today. The Serb see-sawed back and forth with 28-year-old German, currently ranked No. 95, in the second set tiebreak until the former No. 1 double faulted away a match point. Maria didn’t need a green light to step on the gas. Jankovic had quite a talk with her box at the changeover, falling exhausted into the cushy couches, one accoutrement for which the tournament is famous. Maria is one of few women that travel on the WTA Tour with her child and husband, who is her coach. Dellacqua, Kateryna Bondarenko, and Evgeniya Rodina are also in attendance, with children in tow. Bondarenko and Rodina are coached by their husbands, as well. Though Maria could not withstand the deluge of power and will from Jankovic, she won the hearts of fans when her daughter came on court to greet her. Speaking of fans, two women who had come to this tournament since 2001 tried to grab Jankovic’s attention after her win. All kidding aside, Jankovic loves the atmosphere in Charleston.